As I receive discount coupon codes for e-cigarettes and e-liquids, I will list them here for convenience. These codes are permanent, and don’t change. For a list of short term e-cigarette coupon codes and discounts, be sure to check out my discounted section. Highbrow Vapor E-liquid 10% TUC Extensive selection of e-liquid flavors. 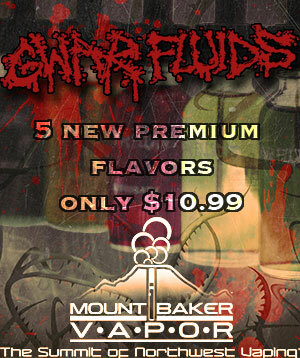 Mountain Oak Vapors 10% TUC E-liquid and e-cigarette supplier. Smokeless Image 10% YOURVOLT70 10% OFF entire order. Vapor Couture 10% tucvape Vapor Couture specializes in e-cigarettes and accessories specifically for women. Vapor4Life 20% VAPOR20 Applies towards Titan E-Cig starter kits. South Beach Vaporizers 10% ECIGDEAL 10% All eCigarettes Disposable and Kits & Free Shipping. My Freedom Smokes 10% J1S1U5J Excludes wholesale and sample products and quantities. Limit One Use Per Customer. The Magic Mist 15% TasteTheMagic One time use.